UFAI's Dr. Bob Baravarian discusses bunion causes and treatments. A bunion typically appears as a bony bump on the inside edge of the foot, where the innermost bone of the foot meets the big toe. Bunions are one of the most common foot problems, affecting an estimated 25-33% of adults. Bunions occur the most in women and older adults. Is Surgery the Only Way to Fix a Bunion? Foot types are hereditary. You may have inherited flat feet or loose ligaments, both of which can contribute to bunions. Missing bones, flattened arches, short first metatarsal bone, asymmetry of the legs or a foot injury may all result in the development of a bunion. Relaxin, the hormone that helps widen the pelvis during pregnancy, can also soften the ligaments in the foot causing the bones in the feet to spread out and arches to fall. This can result in bunions. High heels can cause tight calf muscles resulting in load-bearing to front of the foot and gradual arch collapse. Additionally certain shoes, such as pointy or narrow shoes, can force your foot into an unnatural position. Up to 90% of people with RA develop foot conditions, including bunions. Technically, you can only “fix a bunion” with surgery, but many patients don't need it to get symptom relief. In its early stages, the progression of the bunion deformity can often be dramatically slowed. Removing pressure from the bunion area and balancing the tendon and ligament alignment are the primary goals of mild bunion treatment. For example, it is important to wear shoes that have sufficient room in the toe area to accommodate the bunion ─ that means softer leather shoes to mold to the deformity and platform type heels for better foot and arch support. Your doctor may also advise the use of pads to protect the bunion from shoe pressure. Customized shoe inserts, called orthotics are made exclusively for your foot and are often used to correct the alignment of the arch and big toe joint. In some cases, physicians also use anti-inflammatory creams around the bunion. Read about UFAI manufactured custom orthotics. A bunion is considered moderate when it pushes against the second toe. In fact, over time, the big toe can force itself under the second toe, causing it to buckle and form a "hammer toe." If non-invasive treatment is not effective, and the joint is still causing discomfort, the doctor may suggest a bunionectomy to realign the big toe. With this procedure, the bunion head is moved over realigning the angled great toe joint back to a normal position. The tendons and ligaments are also balanced for a more normal pull on the toe. In moderate bunion cases, you will experience a relatively rapid recovery. The procedure allows for immediate weight on the foot in a boot and return to tennis shoes in about a month. The choice of procedure best for each patient depends on the deformity size, the stiffness of the 1st metatarsal and the ease of realignment of the 1st metatarsal during the clinical exam. Learn about the different bunion surgeries performed by UFAI's bunion specialists. In severe hallux valgus bunion cases, the first long bone (metatarsal) in the foot dramatically shifts away from the second metatarsal, resulting in looseness and a large deformity. In severe bunion corrections, a surgery known as the Lapidus procedure realigns the first metatarsal into its natural position. Using screws, the surgery holds the bone stable so it does not shift again and reduces the change of the bunion returning to basically none. Surgery may also involve removing the enlarged portion of the bunion region, cutting and realigning the bone, and correcting the position of the tendons and ligaments. By using a special plate with Lapidus procedures, our patients are able to put weight on their foot after only 2-3 weeks, rather than the typical 6-8 weeks. UFAI patient Barbara tells how bunion surgery changed her life. Yes and no. Unfortunately a bunion never goes away on its own and you can only “fix” a bunion with bunion surgery. But there are a number of non-surgical treatments that may help relieve the painful symptoms of a bunion..
A quick tip before we start: don't ignore a bunion! Pretending they are not there almost always contributes to them worsening. So, it is best to accept it, be aware of them, and give them some love and attention to slow bunion progression and reduce discomfort. Comfortable shoes with a soft and wide toe box can allow the foot to stretch out without putting pressure on the base of the big toe. Pointy shoes put pressure on the bump, causing more pain and can promote the development of a bunion. Because bunion formation is often greatly influenced by midfoot instability, adding arch support and hind foot and midfoot control and correcting the foot position can slow the worsening of bunion deformities. Some modifications and corrections can be built into the orthotic to off weight pressure to the bunion area. These include silicone gel sleeves that cushion directly over the bunion prominence. Moleskin can reduce rubbing in certain shoes. Toe spacers placed between the big and 2nd toe can help better align the big toe. Steroid or cortisone injections can reduce pain in the short term but are quite negative to the soft tissue structures and should be used very sparingly. They can thin the skin and joint capsule. Topical medications like compound creams, BioFreeze, Voltaren gel, Lidocaine patches can all help reduce pain and inflammation. New techniques such as PRP or amniotic membrane injections can improve a painful joint. Ice packs and over the counter medications such as nonsteroidal anti-inflammatory drugs can also be used to relieve foot pain and reduce swelling. Low impact exercises such as stationary biking put less stress on the bunion. Stretching exercises and range of motion maneuvers can help reduce bunion discomfort. The 1st metatarsal and big toe begin to assume a position that is out of alignment. Pushing and manipulating the 1st metatarsal over and straightening the big toe, then moving the big toe joint up and down can encourage better motion and position of the big toe. It can also help prevent stiffening of the big toe joint in a misaligned position. There are bunion night splints that place a corrective stretch on the bunion and big toe joint. They can be very helpful to keep the joint stretched out, avoid stiffening in the misaligned position, and can help slow the worsening of the bunion. While we hate to recommend a less active lifestyle, if bunions begin to hurt, it may be wise to modify activities. For exercise, choose activities that don't include repetitive pressure on the ball of your foot (things like lunges and step aerobics may be contributing to bunion pain). There are plenty of exercise with lower stress on bunion areas, like stationary bike, rowing machine, swimming, weight training, etc. Many patients ask "When should I have surgery?" In most cases, we recommend you consider surgery when it is regularly painful, and has begun to limit your desired activities. When this happens, it may be time for surgery. For a young person with an adolescent bunion we usually hold off until they are thirteen or fourteen, when the growth plate in the foot has completely closed. If conservative bunion treatments don't work, it's time to discuss surgical procedures with a highly qualified and experienced foot surgeon. Years of research and experience has proven that no one bunion surgery procedure works for everyone... far from it. 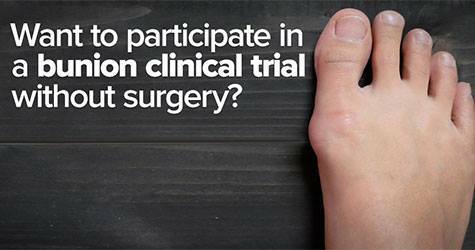 Yet the vast majority of bunion surgeons perform just one procedure for all of their patients. Unfortunately this leads to a lot of bunion surgery failures. How do we know? Because almost 25% of our bunion surgeries are fixing other doctor's work, which is terribly sad because the patient needs to go through yet another surgery. It’s our experience and expertise with the different bunion surgeries that allows us to determine the very best option for each individual patient. This means the quickest, most comfortable, pain-free and successful surgery available. Read about the bunion surgery options available at UFAI. We work with manufactures in the development of surgical products and appliances and always are conducting studies to advance the state-of-the-art technologies used in bunion surgery. Currently we are studying the relevance of bone marrow infusion and gelling techniques for several types of bunion surgeries including the Lapidus Procedure. Our surgeons are often asked to share their experience and expertise. They have published dozens of articles and case studies in many scientific journals, including Podiatry Today and Clinics in Podiatric Medicine and Surgery. They are regularly invited to lecture at The American College of Foot and Ankle Surgeon and Western Podiatric Medical Association conventions, as well seminars around the world. How to Choose Shoes That Won't Make Your Bunions Mad (Even High Heels)! Walk Easier With High Tech Aid for Your Ankles. Scientists Study Gait and Design a Robotic Exosuit That You Wear! Put Your Feet First. Here are 10 Reasons to Consider Retiring Those High Heels. Women, Men, and the Allure of High Heels: Why Do Women Wear Them? High Heels: How Did They Ever Come To Be AND Men Wore Them Too! I Just Had Bunion Surgery….Now What? Bunions and Bunion Surgery, UFAI's Next Free Seminar! The 10 Worst Shoes for your Feet... Part 2! Women, High Heels & Bunions: why can't we all just get along?